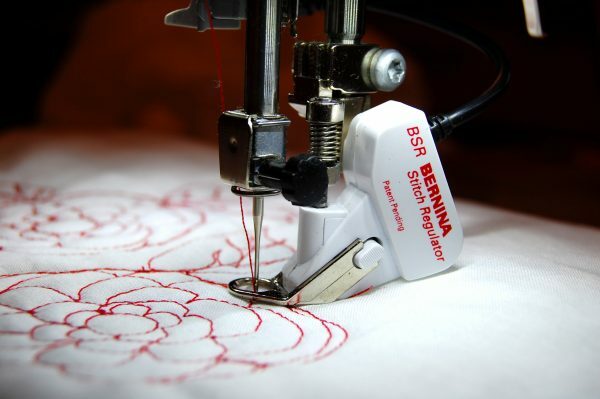 Welcome to our 125 years celebration of the BERNINA company! We’re celebrating by bringing you lots of inspiration and today we’re focusing on basic free-motion stitching with the BERNINA Stitch Regulator (BSR) tips and techniques. As a bonus we’re giving you the chance to win a bit of BERNINA gold, scroll to the bottom of the post to find our anniversary giveaway! 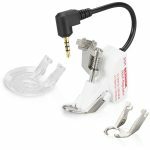 If you’re not familiar with the BSR accessory, click here to find out everything you need to know about the BERNINA Stitch Regulator! Before using the BSR you’ll need to get ready for free-motion stitching. Follow along with Lori Kennedy’s Twelve Steps to Free-Motion Quilting before you start to stitch. Be sure to also read our Top 5 Tips for Successful Free-Motion Quilting before you sit down to sew with the BSR. 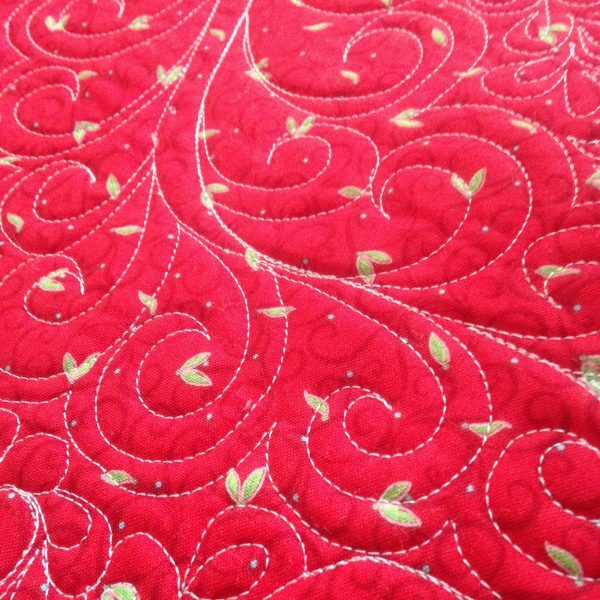 The key to using the BSR or any foot for free-motion quilting is to move your fabric at a steady, even pace. Kerby Smith passes on some solid tips to Find Your Natural Stitching Speed here at WeAllSew. The BSR can help keep your stitches even when you are quilting large areas with fill stitches. Lori Kennedy shows you how you can create Fast, Easy Machine Quilting Fills that are perfect for use with the BSR. 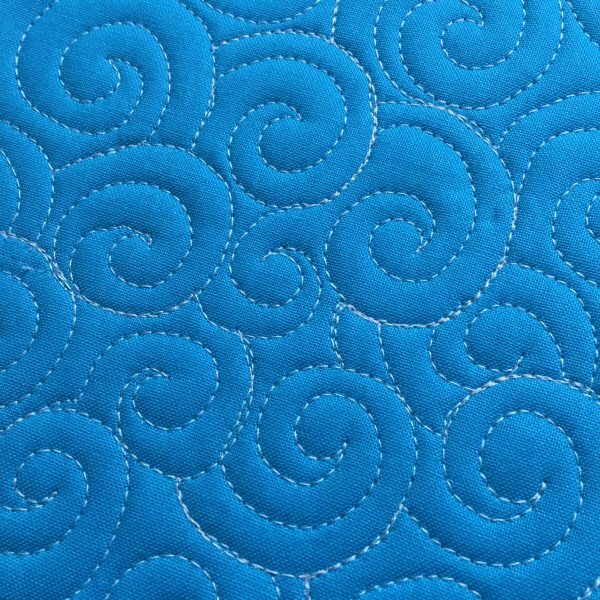 Learn how easy it is to create stitched swirls using FMQ from Amanda Murphy! Visit the Free-Motion Quilted Swirls video tutorial here. Free-motion stitching pretty feathers is a breeze with the BSR. Learn How to Quilt Feathers in this post from Amanda Murphy. With any kind of stitching, BSR included, practice makes perfect! 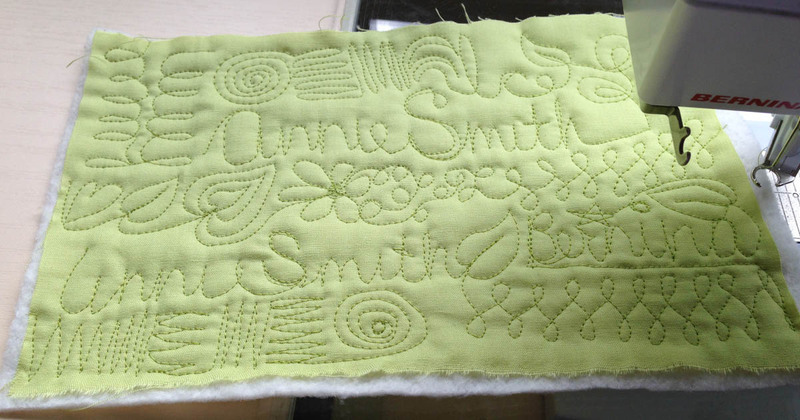 Hone your skills with these fun Free-Motion Quilting Exercises from Annie Smith. Learn how to make different patterns in this four-part series that takes your FMQ skills with the BSR beyond the basics. Find the first Free-Motion Quilting Series post from Megan Bohr here. August 125 Years Golden Anniversary Giveaway! One lucky WeAllSew reader will win a BERNINA 125 Anniversary foot #1! 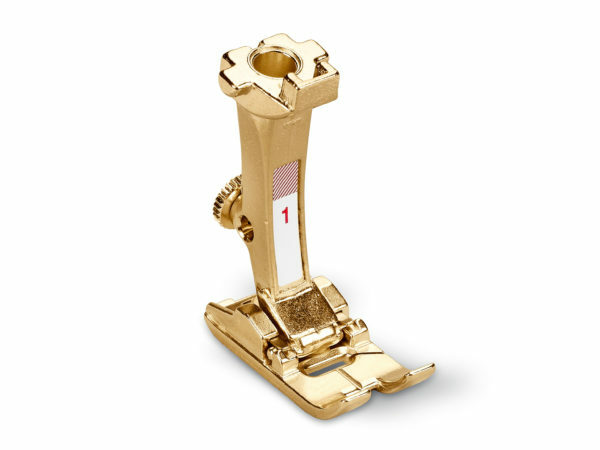 Coated with 24K gold, the special edition Reverse Pattern Foot #1 sparkles and shines with a value of $125.00. All you have to do is post a comment below and answer the question, “Do you free-motion stitch with the BERNINA Stitch Regulator, or with a different foot?” The the giveaway is open through Friday, August 17! The giveaway is open to residents of the 50 United States and the District of Columbia. One comment per fan. Comment must be submitted to the WeAllSew.com blog by August 17, 2018 at 11:59 PM Central Time. Winner will be chosen randomly. Winner will be notified by email and will have 48 hours to contact to claim the prize. I free motion quilt with the darning foot. The BSR is on my wish list. I FMQ with #26 foot on my 790+. I also like the open toe embroidery foot so I can see where I’m going. Love using my BSR. Also use a Gammill but love the creativity of Bernini BSR. I have used the darning foot for years, and have not had success with the BSR. I am not happy with it telling me what to do! I took a class on using the BSR. It was very helpful, nothing like having instant guidance! I have used the BSR and it is great for learning, however now I have been using foot 72 with rulers. Yes, I always free motion stitch with the Bernina stitch regulator. I love it !!! I have a 1080 that I use to quilt with at sewing retreats and in my 24 foot camper! I use the darning foot to do free motion quilting. I also in a B740 that lives in my sewing studio at home. I use that mostly for clothes construction. I am learning FMQ using my BSR. I would love if there was a ruler foot that could be attached to the BSR! I’ve used the BSR for a long time, but I’m finding that I use it less these days, as my quilting has improved over time (finally!). Besides, I’m really loving the #72 ruler foot, which means I can’t use the BSR at the same time. 😉 Still, I don’t want to be without the BSR — it’s great! I’d love a stitch regulator, but I do okay with the ruler foot, which doesn’t cost as much. I got my Bernina 790 PLUS only two months ago; This machine is great, and I have so many things to learn that I did’nt yet use the BSR! But of course, I will as soon as possible! I use my stitch regulator and I use other feet. It depends on what I am quilting. I wish I could have it for ruler work (or its equivalent)! I do use the BSR foot!! And I love it, I also use the 24 foot. With both feet you can do anything!! Yes, I use my BSR. I love the tips. Still practicing to get even better. The Anniversary foot sure is pretty. It would look beautiful on my machine! Goodness, Gracious…of course I use my BSR when doing free motion artwork! I’m researching info on using the BSR foot. Gathering info, looking at other’s work and working up the nerve to try it. Why is it so hard to start… it’s not like anyone is looking over my shoulder? I gladly admit that I keep getting distracted by all the lovely embroidery patterns….can’t seem to stop buying them. 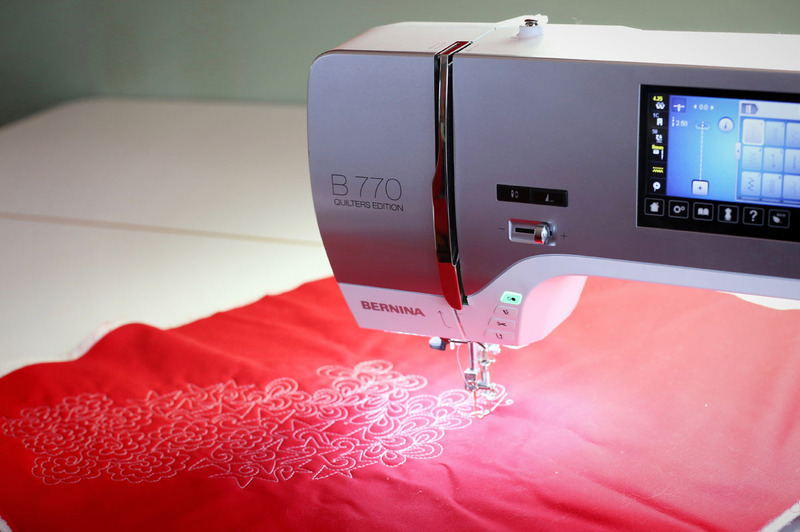 The Bernina 770QE is the best quilting and free motion machine ever. I use it all the time. I have learned so much from We All Sew articles. Keep up the fantastic work. Just finished my first quilt w free motion quilting and using the BSR on my new 880 Plus to quilt the daisies and leaves. I’m so happy with the results. I would never have quilted it as well with a regular free motion quilt because I’m a novice. Learned about this amazing machine at the Bernina class “Fear No Fabric” with Sandra Swick. Highly recommended! Just beginning use of BSR..looking good. My BSR foot on my B570QEE is a recipe for success! I use my darning foot. I use my BSR but need to practice more. I would love to have one of these BSR. Looks like you can do wonderful things with it. Hello. I just purchased B770QE. And I’m so excited to start quilting with BSR. Just started ruler quilting but have quite a bit of experience free motion quilting on my Virtuosa 153. I use the stitch regulator foot works great. I use my BSR for free motion quilting. I only recently bought my BSR, but I already can’t do without it! I use my BSR for free motion quilting. I just recently purchased the #72 ruler foot and rulers and played with that this weekend. My birthday is the 16th and this would make a spectacular gift! I do FMQ with my stitch regulator and also use a ruler foot for working with the rulers. I love the quilting part of the process. I do love using my BSR….it’s great to use! I use the BSR for free motion but still haven’t quite mastered the hand motion. Recently purchased a ruler at my Bernina store. Loved it. Need to practice. I’ve had a BSR for ten years and used it lots, do also use my walking foot. A wonderful tool! I am learning to use the BSR and have tried the darning foot as well. Truth is I am learning to free motion quilt as I was primarily a hand quilter. I figure since the BSR came with my machine, I might as well learn to use it. I use the BSR for free motion work. Still learning, but what a fantastic invention. It has taken a little bit of time to figure out my best working speed. Hoping that we will eventually be able to do ruler work with it. My main reason for purchasing a 770QE was to get the stitch regulator. It has saved me so much not having to send my quilts out to be quilted. I started practicing on ones just for me & my family and have proceeded to do some for gifts. I JUST LOVE the stitch regulator! I don’t have a BSR, so I use my #24 foot for my infrequent FMQ. I love my old Bernina, but I often look longingly at the new models with their many bells and whistles. I started FMQ when I purchased a used 550QE and learned to use the BSR. I’ve progressed with my quilting and now have a Q20 with 2 BSR’s! Love the Bernina BSR!!! I now can FMQ on other machines without a BSR but find using the BSR so much more enjoyable and I can relax while quilting. The BSR has a learning curve to it. Although the instructions sound easy, you have to get your brain in the right mode to get it working. There are two settings – use a quilt sandwich of scrap fabrics to practice. After about 10 or 20 minutes, you’ll find the settings that work best for you and you’ll be able to confidently attack your quilt. I wouldn’t hit the quilt without a practice session because if you haven’t used it in a while your hands can forget what they’re supposed to do. It works beautifully after that. I’ve only made 2 quilts so far. I used the BSR on the 1st one to trace the designs on the fabric. On the second one I just made large swirls. Took awhile to get the hang of it, by the time the quilt was done I felt much more confident. Guess I’ll have to make another quilt now. Love my Bernina! I like to embroider nice quilt designs in open blocks then use the BSR to fill in the rest of the quilt, sashing and borders using techniques learned from Lori Kennedys’ site. She shows so many options! I have the BSR and need to spend time with it. Maybe now that I`m retired I can get to work on my quilting list!! I started free motion sewing with the BSR with my 830 and 580. After awhile and doing more quilts I broke down and bought a sit down Q 20. I take the BSR to my quilting group with my 580.
soon as possible. I can’t free motion quilt without it. I use the BSR most of the time but I am also looking forward to using the new ruler foot with my 820. I love the extra throat space for quilting. It is fun to play with designs and free motion. I’ve just started to free motion quilt on my B530. I bought a BSR and, although I need a lot more practice, I’m really enjoying learning to free motion quilt with the BSR. I use the BSR for free motion quilting. My current challenge is free motion quilting daisies on a quilt I made for my daughter. I use a BSR on my 580. I look forward to improving my all FMQ techniques with this great blog post. Thank You. My newest machine is a Bernina 550 QE. It came with the BSR which I am looking forward to learning to use. 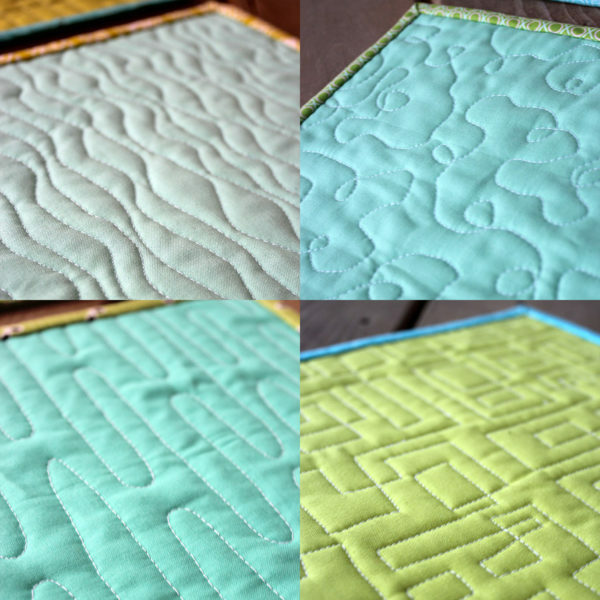 The BSR is the best thing for anyone to learn free motion quilting. It gives a person confidence. Thank you! I usually use my regular embroidery foot 26, am looking forward to learning how to use the BSR. I use my BSR all of the time and I love it! I use my Bernina stitch regulator for free motion stitching. I’m not as accomplished with it as I’d like to be, but it’s helping me get better! I’m really glad I have it. I am just beginning free motion quilting and enjoy the hobby. I love my BSR. I use it to do all my quilting but am still learning to be steady and even with my stitches. I’m starting to do designs now for different looks. Love the BSR. Looking forward to trying the practice tips from your tutorial. I love using the BSR. Great foot. I use my BSR. Still trying to get the hang of moving my quilt in an even manner but practice makes perfect. I love it! I absolutely love the BSR foot for free motion quilting, anyone can do it with little practice! 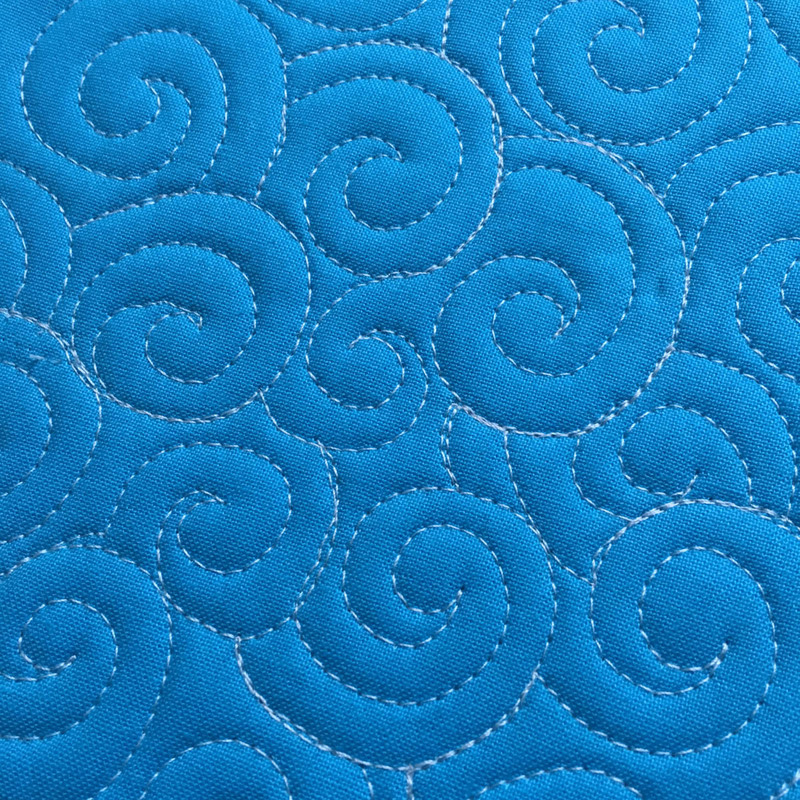 I use several different techniques when free motion quilting. The Bernina BSR is always an important part of my free motion quilting. This foot is amazing… it jumps you free motion skills light years ahead. It adjusts to your “rhythm “ and helps you achieve stitch perfection. The ability to free motion with a zig-zag stitch is such a bonus, and a wonderful technique to use when thread painting! I can’t even imagine trying to fmq without my Bernina BSR. I use a darning foot! I’m still learning but I use my BSR when I can. I have used the #72 foot with rulers but I am not smooth enough with that yet. Love my stitch regulator! I’ve not quite got the knack of free motion without it, but I’m working on those skills! The regulator is my go to! I use the darning foot to fmq. The BSR is on my wish list as I don’t keep my stitches very even. Use my BSR and have used tips from Lori Kennedy. I just need lots more practice. I use my BSR most of the time, but I also use foot #24 some of the time. I just got a new Bernina 570 QE and I am very excited to try the BSR! I use my BSR and love it! I watch a lot of videos to hone my FMQ skills. Love my Bernina! I have just begun “playing” with my BSR. I am enjoying the process and trying to quilt a little each day. It is fun to see the improvements I am making! BSR.….How do I love thee…..let me count thy ways….it is so cool, what did I do before I had it? I used any foot that worked on the project I was making….but I love my BR. I am just beginning but I use the BSR. I just don’t know enough to know if that is what I will continue to use but at this point I am happy with it. Am a NEW learner to FMQ but have the BSR which I use and also have tried my hand at quilting without it. Either way it is fun. I love my BSR. There was a learning curve and it took lots of practice but I’m finally there! I would love to receive this beautiful foot. Thank you!! I use the BSR when free motion quilting. I love my Bernina!!!!! BSR is a dream attachment. I got it when I bought my 750 QE… and I was afraid to use it for a time. 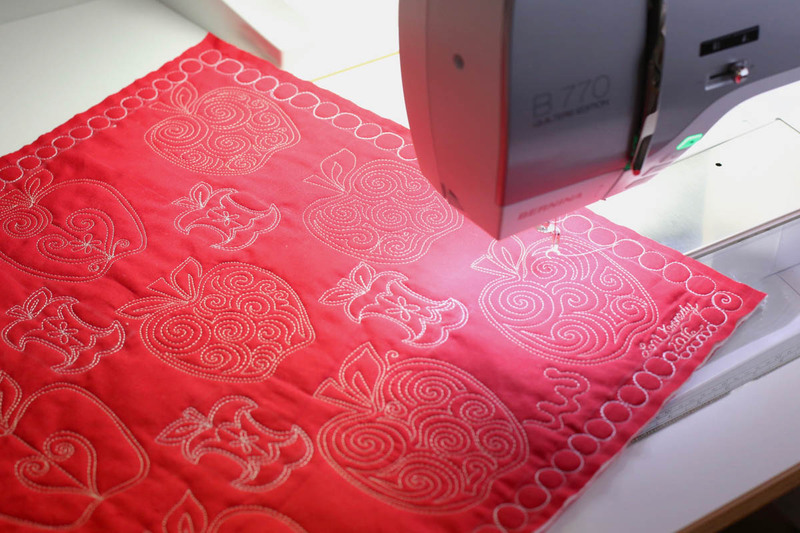 When I put it on my machine and started quilting with the BSR, it was like a dream come true. Smooth stitches began appearing on the quilt. It works like magic! 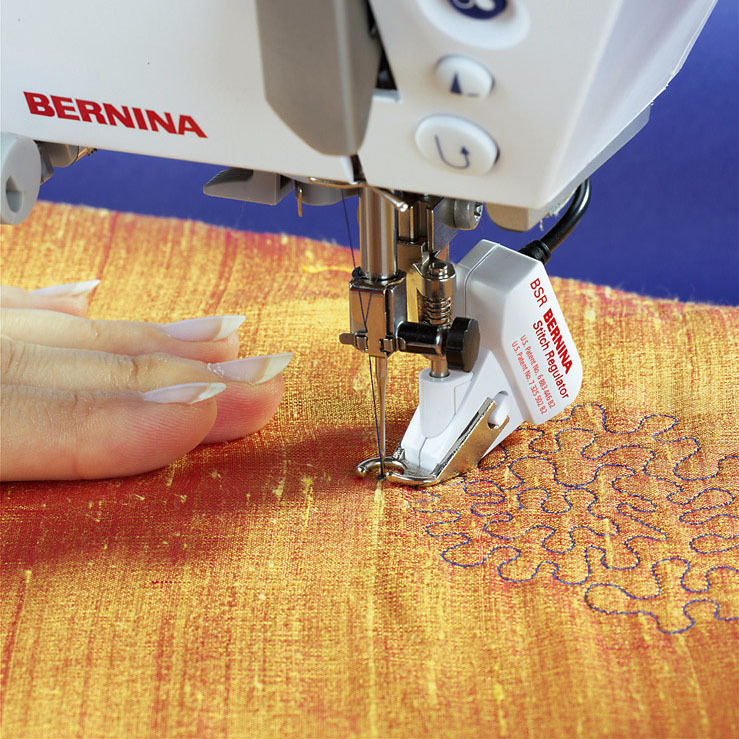 Bernina has many options depending on which machine one has. I use the BSR on my Bernina 880 since it came with my machine and then also foot # 72 with the free motion rulers. I also like free motion foot #29 on my Bernina 350. All these presser feet and now I’m discovering there are other selections too. Thanks! I love using the BSR for free motion quilting but have now started to use the number 72 foot for free motion quilting with rulers. Oh such fun! I like using both a stitch regulator foot and a ruler foot when I quilt, it depends on what I am doing–free motion for overall designs or custom quilting using a ruler. I use the open toe embroidery foot. I have both the BSR and ruler foot at home…in their packaging. I am a beginner quilter, life long beginner quilter, that is trainable and persistent. Luck would have it, I am going to the Houston Quilt Festival this year, and taking two classes with Sue Nichols. The first class is the Bernina quilting with rulers course followed by the BSR class. Yes, I’m going to be using my BSR and ruler foot by the end of the year, and I will begin to knock down my UFO quilt stack. Yeah me!!!! I have just started to learn how to free motion quilt! I can’t wait to get the BSR. One of my three Bernina machines is the Aurora 440. I choose it because it had the stitch regulator and I LOVE it! Although I make a lot of quilts I am also doing more fabric art now. The stitch regulator is sssssooooo nice! I love using my BSR for free motion quilting. I started quilting small projects and have worked my way up to a lap sized quilt. I have a Bernina 750qe, and find myself trying new projects all the time, garments, crafts, applique, and mending. I have gone outside my comfort zone, and LOVE it! I use the darning foot, but getting a BSR is on my wish list. I just borrowed the BSR from a friend so I could see how I would like it. I couldn’t believe it! So much better than the darning foot. I just finished my first king size quilt and the BSR really helped me get it done! I have a 740, I wish it would have come with it! Definetley on my wish list! Have had the BSR since I first got my 830. Never used it to its full ability. Now I am inspired to use it more often. Thanks for the tips. I use the open toe darning g foot. I have a 930 and a 180 and don’t think the BSR will work on either of them. Would love to have one as I do all my own quilting on my machine. I can’t afford to send them oit to have them quilted. I first learned with the BSR, then moved on to the darning foot. Most recently I am using the new ruler foot. I love all three and use them all. The BSR helped me be successful, kind of like training wheels on a bicycle and now I can still use it and also I have learned to use the others. Makes quilting fun because you can do just about anything. I LOVE the BSR and wouldn’t free motion quilt without it! I use the #24 foot most of the time. I have a BSR and I use it sometimes when I have tension issues or if I am sewing back and forth. I have found when I sew back and forth that I don’t take my foot off the pedal and I get extra stitches, but the BSR prevents that. I don’t really like the home machine BSR, but I do have to admit that I have used the Q20 BSR several times and really find that it is amazing. I always use my BSR when doing free motion quilting. I do need to learn more about how to use it though. I do free motion on my Bernina 153QE. I use my quilting foot, which doesn’t have that cut opening. I’ve had my machine for 15 years and it’s been a solid, trustworthy machine. I hope to upgrade in a couple of years, if financially able, so I can learn even more on the newer models. I’ve got my eye on the B590. I’m going to keep these videos you’ve shared to help me improve my techniques, too! Thank you! I love the BSR, i can be impatient when quilting and find this keeps me focussed. I am learning how to use the BSR. It takes some practice. The beep keeps me from going to fast. Thanks for the tips. 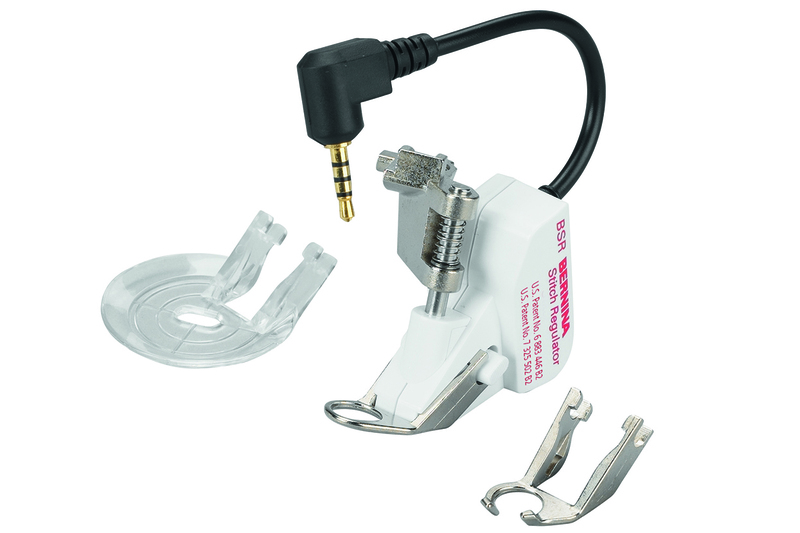 This useful lil’ attachment is another reason I like sewing with Bernina.